Welcome back, my friends, to the show that never ends. I know it's been a long time since the previous installment of this series, but sometimes, that's the way things go. I always intended to come back at the conclusion of Brightest Day and summarize my thoughts on the most recent iteration of everyone's favorite nuclear hero. In the previous segment, I took you through the death of Ronald Raymond, the introduction of Jason Rusch, and the return of Professor Martin Stein to a prominent role in the Firestorm matrix. This time out, we're picking up Firestorm's activities in two fixed-length series, Blackest Night (2009's runaway hit "event" series by DC) and its direct continuation, Brightest Day (which just finished a few weeks ago). Black Lantern Firestorm. Original design by Ethan Van Sciver. It's worth noting early on that Geoff Johns is a master of DC Comics' long and varied history. He began his career as production assistant to Richard Donner (yes, that Superman director-guy) and soon started writing for DC on books like Stars and S.T.R.I.P.E. and JSA. After briefly sojourning down the street at Marvel, he returned to DC where he's been ever since, having written Flash (both Wally West, in the wake of longtime scribe Mark Waid), Green Lantern, Teen Titans, and several "event" series like Infinite Crisis, 52, and the two series I'm about to discuss here. 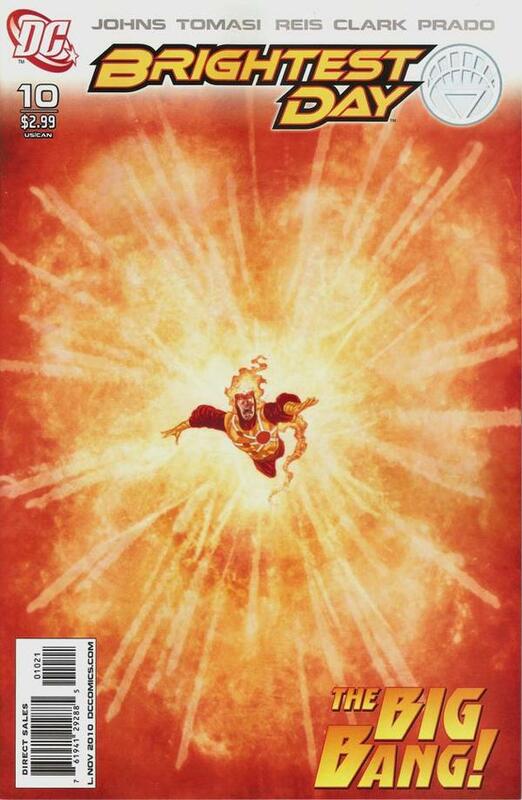 And, back in 2003, he pitched a Firestorm revival that interestingly fused Ron Raymond with his "brainy ex-girlfriend," a take that was tabled in favor of Mike Carey and Lewis LaRosa's version (which I touched upon a few episodes ago). Perhaps that version was a conscious or unconscious inspiration for the latter-day merging of Jason Rusch and Gehenna that opened Blackest Night. The crossover that set in motion everything about Firestorm that continues to date is to a vast degree a Green Lantern story that spilled over to the rest of the DC Universe. Everyone who's familiar with DC lore knows the Lanterns' oath: "In brightest day, in blackest night..." and Johns parlayed the oath into a prophecy of sorts. Not only that, he took the previously-established Star Sapphires and Yellow Lanterns and wrapped them with the Green Lanterns into a color spectrum of powered beings. In the lead-up to Blackest Night Johns introduced the other corps to both explode the Green Lantern brand and set the stage for the massive storyline to come. You don't need to know the gory details for the purposes of this article. 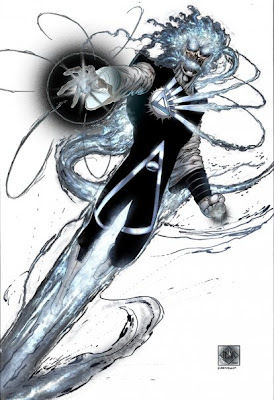 Just know that an old Green Lantern enemy, Nekron, captured the Anti-Monitor (the big bad from 1985's Crisis on Infinite Earths) and used him to establish a beachhead of power in this reality in the form of a Black Lantern whose rings infected dead bodies and reanimated them, using their memories to draw in the living and generate more power. When the rings and lantern were sufficiently powered, Nekron would again rise. Easy peasy? 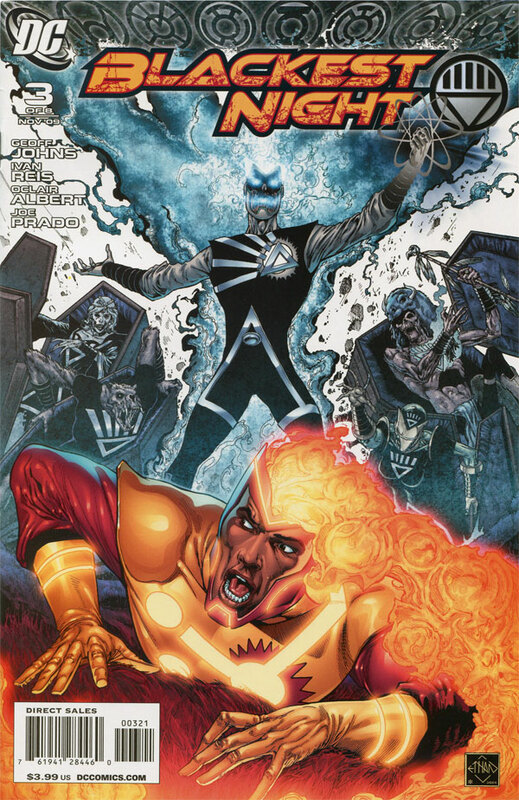 Firestorm, surrounded by his oldest foes all as Black Lanterns. Summoned by an emergency signal at the Justice League's Washington, DC headquarters, Jason and Gehenna arrived as Firestorm and talked with Mera, Aquaman's wife, about the emerging chaos. Green Lantern, Flash, Atom and a group of Indigo Lanterns arrived and compared notes about the Black Lanterns before the BL League arrived. Then, BL Firestorm fissioned his counterpart, removing Jason and Gehenna. He merged with Jason, who watched in horror as "Ron" turned his girlfriend to salt, killing her. The strength of his emotions for Gehenna powered the lantern considerably. In the fourth issue, Jason gained control over BL Firestorm to warn Flash to evacuate the Earth, but soon "Ron" reasserted himself. Jason remained trapped within BL Firestorm for virtually the rest of the story, through the return of Nekron, the introduction of a "rainbow corps" of Lanterns and the White Lantern Entity, and the revelation that life in the DC Universe originated on Earth. Finally, the heroes formed a "White Lantern Corps" and defeated Nekron by using the rings to resurrect a number of characters, from Nekron's herald Black Hand, to the Anti-Monitor, to several heroes and villains including Firestorm, now comprised of Ron Raymond and Jason Rusch. 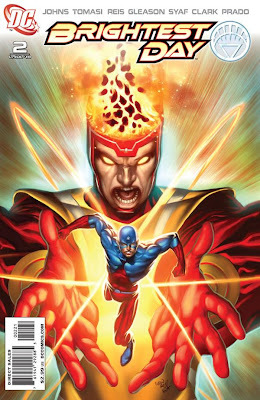 Firestorm and the Atom, together! Art by Ivan Reis, from Brightest Day #2. 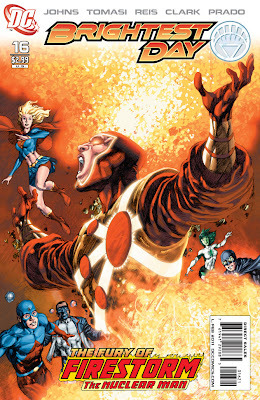 The new status quo of all the resurrected characters became the thrust of the next series, the 24-issue Brightest Day. Was there a method to the White Lantern's madness? Who, if any of those resurrected, would become the Guardian of Life? Would the heroes and villains permanently be returned to life, or was it a temporary situation? As in Blackest Night, there's much more to this story than just Firestorm's involvement, but I'll only discuss the portions germane to our guy(s). Brightest Day began for Firestorm with the wake of Gehenna Hewitt, attended by Professor Stein, Ray Palmer (the Atom), Jason Rusch, and members of Jason's family. Ron didn't attend the funeral, missing appointments to file paperwork with the Justice League to renew his legal status in favor of partying with friends at Pittsburgh University. He also no longer remembered anything that happened after his death at the hands of the Shadow Thief (which meant he didn't remember meeting Jason). Arriving at the wake, Ron talked with Jason but a shouting match erupted, resulting in merging into Firestorm--a Firestorm who could not fission! At Pittsburgh University, Professors Stein and Palmer met to diagnose the problem, and Palmer reduced in size to infiltrate the matrix and discover the source of Firestorm's new instability. He caused an explosion that successfully fissioned them, and Ron and Jason awoke in the hospital, where Stein made it imperative that they remain separate. Ron, who actually did remember some of what had happened when the Black Lantern possessed him, found himself haunted by a salt effigy of Gehenna. Similarly, a disembodied voice nagged at Jason before a crane nearby turned into bubble gum, prompting a disaster that caused him to again become Firestorm. With a hungover Ron in control, the hero vomited a black ichor on someone he saved from the disaster. Ron apologized to Jason and admits he remembered when BL Firestorm killed Gehenna, even as they reached the conclusion something else was in the matrix with them. Firestorm learns his final (?) fate. Cover to Brightest Day #10. Ron and Jason went to the Professor, then, who ominously hinted at a "third and final stage of Firestorm." Before he could elaborate, the White Lantern entity showed them its wisdom: "You need to study," it told Ronald, while it told Jason "You need to get your head out of the books." It told them they needed to learn from each other so they could stop "him"--the mysterious third being in the matrix. During a series of tests back at Pittsburgh University, Professor Stein put forth his theory that the Jason/Ron merger made Firestorm more powerful, but also more unstable. In a bit of retroactive continuity, Stein told Firestorm that his original experiments aimed at finding the spark that led to the Big Bang, and that's what Firestorm is: the universe's cosmic reset button. And the more agitated Ron and Jason become, the more likely the Big Bang would again occur, This is all the third entity needs to know to break free, fissioning Firestorm and rendering the Professor unconscious before standing revealed as the Black Lantern Firestorm, henceforth called Deathstorm. Deathstorm wasted no time in drawing Professor Stein into itself along with Jason's father Alvin before finding its way, Firestorm in tow, to Star City and the White Lantern. It infected the lantern to be able to lift it so that it might bring it to its new master, who also said that Deathstorm must bring him/it an army and stop the Entity's replacement from being chosen. To that end, the creature recreated Black Lantern duplicates of all those the Entity resurrected, and left. 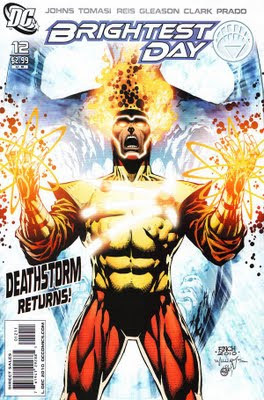 Firestorm traveled to the JLA Watchtower in hopes that scientists Dr. Mid-Nite and Atom might help stabilize the matrix, while Deathstorm toys with Stein and Alvin Rusch, tempting them to kill themselves in hopes his threat would perish. Anger got the better of Jason and Ron, however, causing an explosion that left them as Firestorm in an apparent black void. Did they end the universe? Ah! That classic logo! A terrific cover for Brightest Day #16. Not so fast! Shedding some proverbial light on the subject, Ron found they were amid a swarm of Shadow Demons, which meant they did not end the universe, but instead had been transported to another one: the Anti-Matter Universe, home of the Anti-Monitor and the Weaponers of Qward. After briefly intervening in a battle between some Green Lanterns, Sinestro and the Weaponers, Firestorm finally found Deathstorm, the Black Lantern Corps, and their master...the Anti-Monitor. Now, everything to this point in Brightest Day was a prologue. 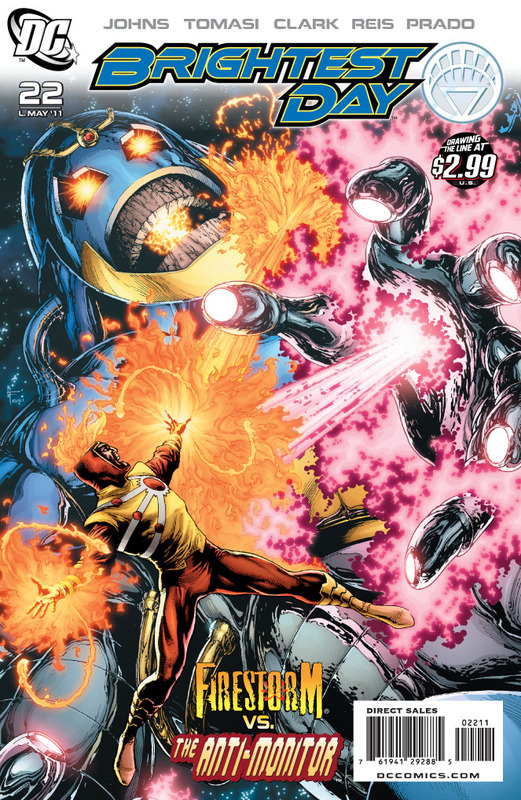 We had solid character development and an interesting throughline that proved Firestorm was among the most important characters in the series, but in issue #22, he finally took the spotlight in an epic battle with the Anti-Monitor. It's a true masterpiece in virtually every sense of the word and one that all Firestorm fans should read. Ron and Jason finally work together to save all life--as well as their "fathers"--from the clutches of ultimate evil and death. 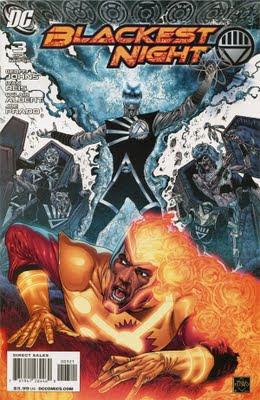 Unfortunately, while Firestorm was able to save the White Lantern and destroy the Black Lanterns, he was not able to save Martin Stein, who sacrificed himself to save Ron and Jason from Deathstorm's transmuting power. Turned into salt the same as Gehenna, he bequeathed his final wishes to the two men, "knowing" that Jason would be a better partner to Ron than he was. His life now returned, Firestorm found himself transported to the Star City forest, where Deadman demanded the Lantern, and the Lantern wished to be given to him. Gary Frank illustrates the final battle between Firestorm & Anti-Monitor. The final two issues really have very little to do with Firestorm, his story all but fulfilled in the previous story. All of the resurrected united at the Star City forest, where Deadman told them they were there to combat the "dark avatar," in actuality the Swamp Thing, the former Earth elemental whose body was possessed by the power of the Black Lantern. The five key heroes--Firestorm, Aquaman, Hawkman, Hawkgirl, and the Martian Manhunter--all transformed into elementals to form a last line of defense until the Entity's replacement could assume his role. Under a tree in that forest was--miraculously--the body of Alec Holland, the man whose consciousness had been imprinted upon the Green to become the original Swamp Thing. Now, Holland literally became the Swamp Thing and combined with the elementals to banish the dark avatar. At the end of the battle, most of the elementals returned to their normal forms and went their separate ways. Ominously, as the main Brightest Day saga ended, a new era dawned for Ron and Jason. Upon examining some tests designed by the Professor, Jason found that the Anti-Monitor's blasts had caused a change in the Firestorm matrix, beginning a countdown to the detonation they all feared. That's where we leave our heroes until their next appearance. The new merger, as previously glimpsed in Firestorm #9-13, was similar to the Jason/Professor merger of Stuart Moore's run in that it combined elements of both the "new era" (Jason) with the "classic era" (Ron) in hopes of pulling both new and old fans along--a smart move. This time, however, Firestorm returned to being about the "dumb jock" fused with the "intellectual" that fell in line with the original Conway/Milgrom iteration, getting away from the "dual intellectual" bit of Moore/Igle vintage. Only this time, due to popular demand, DC forsook one type of comic book minority (the fifty or sixty-something Stein) for another (the black Jason). They even went so far as to kill Martin Stein--my favorite character in the mythos--and with his parting words Geoff Johns and Brightest Day co-writer Peter J. Tomasi hit fans over the head with how much better a partner Jason would be than he was. It was one powerful line of dialogue for its sheer wrongheadedness, a moment where it felt less like the character saying the words and more like the writers forcing them in. Deathstorm! Cover by David Finch. Instead of getting a "voice of experience" in the dynamic, we now have two guys who are similar enough in age whose key differences are in intelligence and skin color. (Is anyone other than Kurt Busiek really going to call Ron Raymond "experienced"?) In selecting a Jason/Ron merger, Johns and Tomasi established a racial dynamic--or, at the very least, a stereotypical one where Jason functioned as the "angry black man" and Ron as a similarly intolerant white man who found themselves at odds, sharing the body and power of Firestorm. (It's not the first time such a dynamic has been used--anyone remember that Blaxploitation film, "The Thing With Two Heads"?) The point was even made explicit by Deathstorm in one of his early non-appearances. I do enjoy the dramatic tension of having Ron and Jason at odds, and I do want it sticking around, but it goes without saying I want the racial undercurrent to be curtailed. 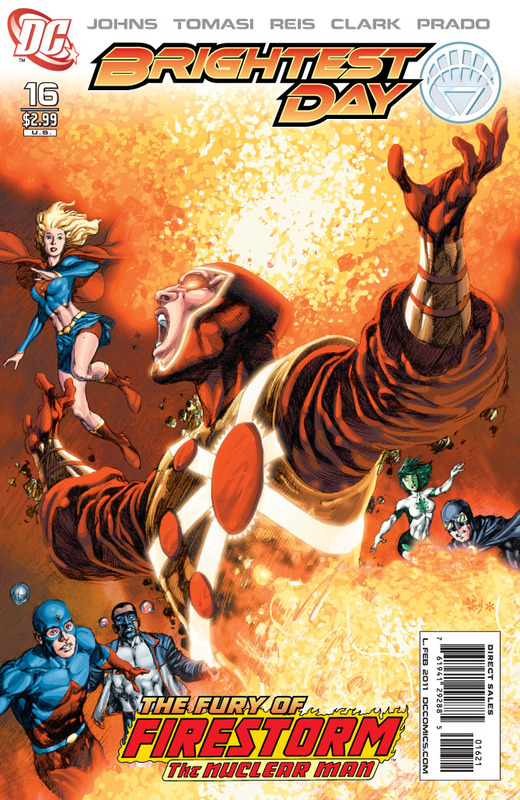 The light antagonism is a plot point that didn't gain much traction in previous Firestorm series, with perhaps its strongest showings in John Ostrander's first issues (wherein Ron and the Professor were at odds over the ban on superheroes during the Legends crossover) and early in Dan Jolley's tenure, where Jason got to pick his partners in the matrix. In some ways, the infighting between Ron and Jason highlights a key distinction and an evolution in Firestorm that I'd love to explore in deeper detail. Subtextually, the original relationship between Martin Stein and Ron Raymond was always depicted as one between a father and son, with Martin as the father that Ed Raymond couldn't be. Johns and Tomasi made that relationship explicit with Stein's death, while the entire Brightest Day arc functioned to establish a different dynamic between Ron and Jason Rusch. Since the Professor mentored them both, one can easily read the characters' antagonism and their very relationship as being between brothers--moreover, brothers who have experienced the loss of their "father." An intriguing shift, to be sure, and one that I hope DC will investigate in issues to come. Deathstorm, Deathstorm, Deathstorm. More by Ivan Reis. 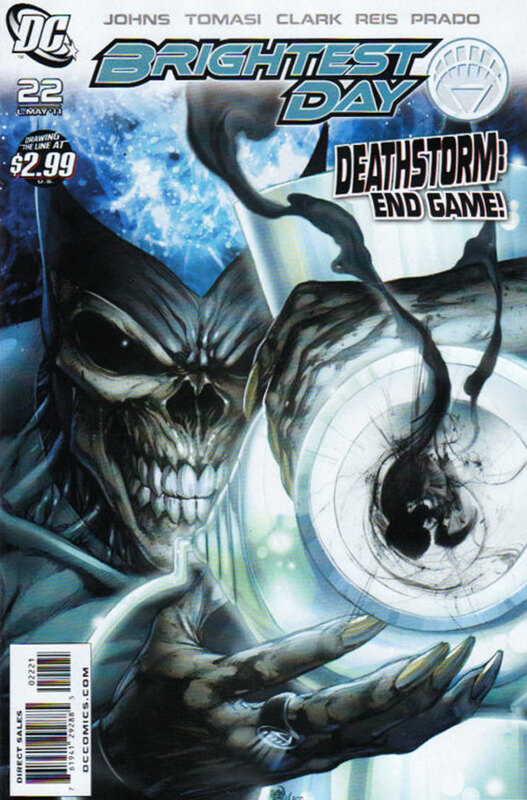 As far as villains go, Deathstorm seems like another "dark mirror" character in a long line, which is interesting since Firestorm already had one in Shadowstorm. It's true, he's all but forgotten--didn't he die in Captain Atom?--but since when did that ever stop a character from returning? While Shadowstorm was often too straight-faced, too stoic, too eeeeeeevil, Deathstorm was too often off in the other direction, with his deliberately horrible "surfer dude" dialect. I hear he'll be back, but I'm not so sure I like that prospect. So, where are we heading from here? I keep hearing September will be rife with new first issues and it's obviously when the new Aquaman (by Geoff Johns & Ivan Reis) and Hawkman (by James Robinson & Rags Morales) series will debut. However, DC's made definite plans for Firestorm as well, and I wonder if we won't see a brand-new Firestorm #1 in September as well. At the very least, we should soon see him in a book like Justice League of America or somewhere his new, post-Brightest Day status quo can be explored. 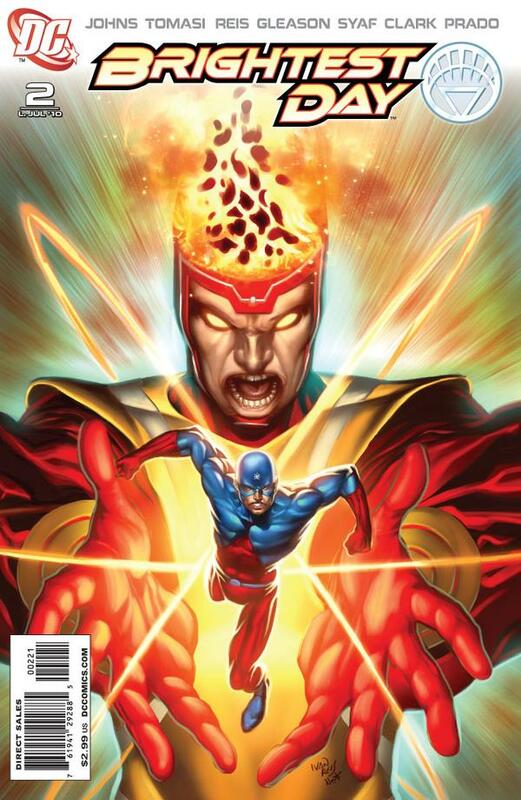 Who could be writing the book, if Firestorm returns to a solo series? I don't know, but you can bet that you'll see an interview with the new guy (or girl) either here, courtesy me, or at FirestormFan.com, courtesy Shag, that site's owner. I'm feeling good about this. I can never tell if two comments from "Anonymous" are really by the same person, so please, especially if I know you from other websites, leave a name or alias or something! Thanks! What? No INCREDIBLE HULK #650 in 2012?